“Sounds for a While” is a foray into the quandary of defining music by the Deutsche Oper Berlin. It runs between 25, 27, 28, 29, 30 June to 2 July 2015 at 20:00 at the Tischlerei Stage of the Deutsche Oper, Bismarckstraße 35, Berlin. 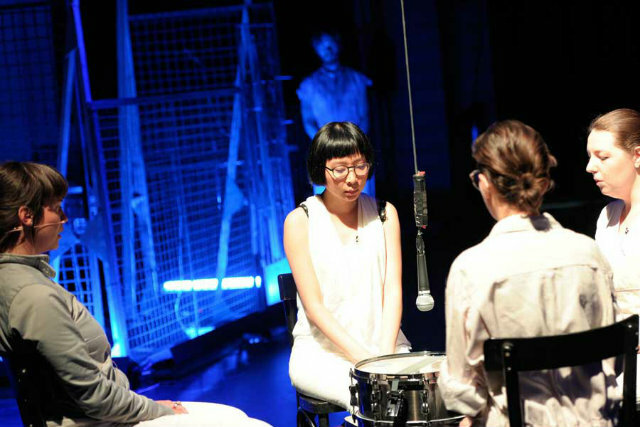 It is a self described musical theater installation presented by master’s students of the University of the Arts Berlin Sound Studies program, directed by visiting professor Hans Peter Kuhn. This show dives headfirst into the murky and argumentative pool that contains the dispute over the definition of music. Designed to be a performance from before the moment of entry, audience members waiting for admittance into the show are treated to the sounds of a woman who is alternately grunting, moaning, and making vocal swoops. 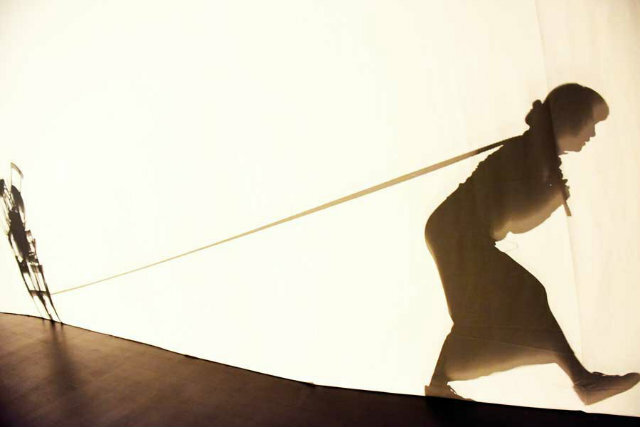 The opening of the doors is done by one of the performers with a mysterious look in her eye as she allows the audience to enter. The entrance delivers the audience to a rhythmic spectacle of chairs scraping across the floor. From the start there is anticipation as to what will be presented through the show, and it only increases throughout. The presentation of the piece in the Tischlerei of the Deutsche Oper, is an appropriate location for it. The audience can freely wander through the set during the show. The performers do not interact with the audience but gracefully track their steps around any audience members. The performance flows smoothly throughout the pieces as one feeds directly into the next, challenging one to stay abreast of the situation. It could be asked if this is indeed music that is being presented, but even more relevantly, the question is begged, why is this piece being presented? “Sounds for a While” challenges its audience to confront the dilemma not only of what music really is, but also more importantly, what can one do with normalcy? The use of mundane daily articles, such as chairs, rubber bands, buckets being splashed by drops of water, fart sounds and more are transformed by amplification and become anything but normal. It is tricky to not add interpretation to the pieces, but important not to as any attempt at that will soon fall flat as yet another astonishing twist occurs. True, that in daily routine there is noise, true that the definition of music is forced to grow as the technology of the age expands, but throughout it all there is a whispered question: “what can you do with your life?” The performance does not present an answer, but the use of prosaic daily articles to create a performance that is anything but mundane intones that there is something more. The performance is limited in its emotional range however. The performers are mostly flat, with a few moments of either loneliness, as in Siri- Orakel, or aggressiveness, as in Dido’s (ugly) lament and the growling dog in Die Opfergabe. There is a feeling of emptiness as the performance progresses. The one brilliant exception to this is due to the interaction between the performers in Im Knast, mit Ärger where the prisoner delicately plays the bars of his cage until he is assaulted by outsiders banging on it. 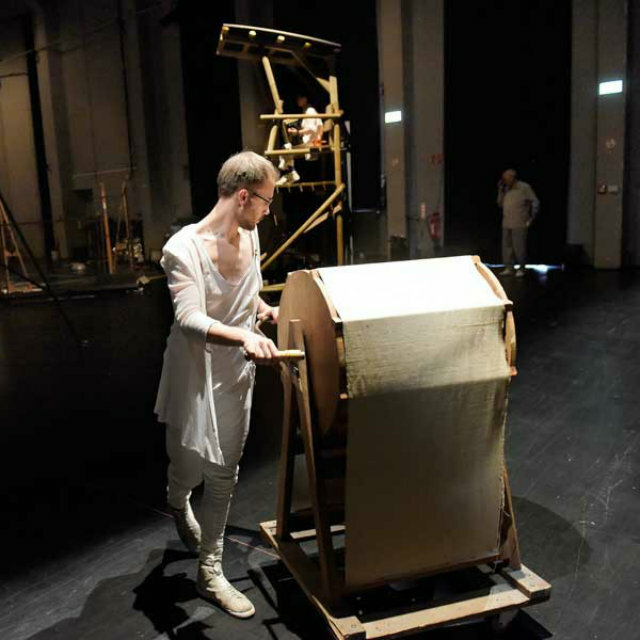 The show presents an interesting interaction of objects with technology, but by the end of the performance the audience is left with a vacant feeling. As Siri quotes H.L Mencken, “love is the triumph of imagination over intelligence.” “Sounds for a While” is a triumph of intelligence and imagination, but it is lacking in passion.